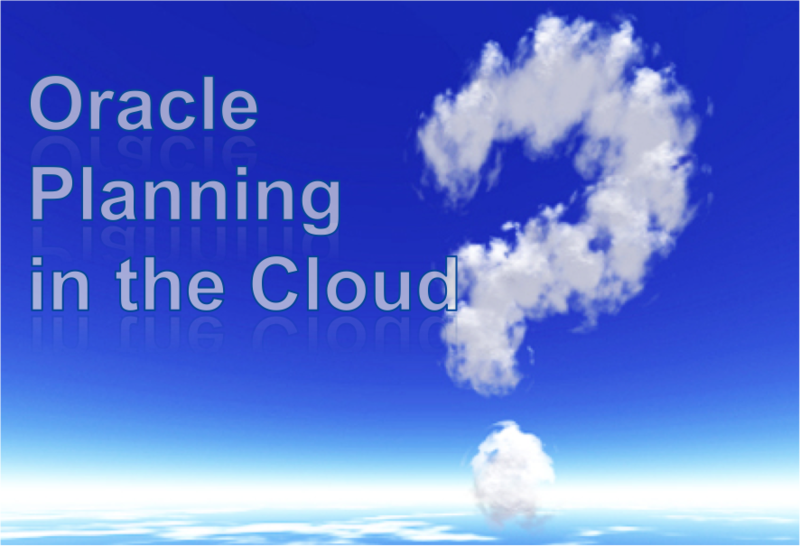 Hyperion Planning in the Oracle Cloud – is it right for you? At this year’s OOW, Oracle announced continued use and expansion of Oracle products on the cloud via a SaaS model. Specifically announced is the ability to now provision Hyperion EPM Planning on the cloud. That means that the Planning and corresponding financial reporting services have been certified on the O’Cloud platform, running Oracle Linux of course. What’s the motivation? The main driver is that 35% of large companies and as much as 65% of mid size companies are still using spreadsheets or legacy apps to meet their core management processes. (Gartner) Moving to an in-house enterprise best practice approach for planning, budgeting, and forecasting for small to midsize companies is difficult due to hardware costs and the need for in-house IT maintenance expertise. Also pointed out by Oracle is the fact that more and more BI initiatives are being run completely on the business/finance side of the house, moving those projects away from traditionally IT-based projects. Of course since finance departments almost always lack internal departmental technical IT expertise, a totally outsourced hosted environment is an attractive option. Cost effective for small companies. Offering a Software as a Service model allows for companies to quickly provision instances and get started right away without a big upfront hardware spend and setup. The monthly subscription based cost structure eliminates hardware depreciation, datacenter requirements, power burdens, etc. Easy self service provisioning and scaling is built in. You can stand up an environment fairly quickly, with little to no help from internal IT. Can get it along with Cloud based Oracle Financials as well. The most interesting and somewhat funny fallout of this initiative is that Oracle now feels our pain. Oracle is getting a heavy dose of reality on what it takes to actually implement their software in a production mission critical situation for live customers. Delivering EPM as a paid service demonstrates challenges associated with maintaining availability and accountability in a new way. They now have to face challenges we all do around system monitoring, backup/recovery, repeatable deployment, high availability, etc. Real life challenges such as data source integration, external authentication communication, drill back, encryption/security, Unix supportability, firewalls, device drivers, change management, are in their face more so than ever… and I love it. Ahh welcome to my world , Oracle. For example: they realized they would have a challenge to do something like create a planning data source for Planning applications since it is creating back-end databases connections. So, they created Planning data source wizard that had to be made specifically for the cloud. I like this, but it’s a tool they had to specifically create for the cloud since it is creating back-end databases connections. The services they intend to provide contain a firm’s most sensitive data. The biggest barrier for companies to consider the Oracle Cloud services is the natural and understandable uncomfortable feeling they will experience having their sensitive financial data shared outside their own secure datacenter, regardless of Oracle claims of security and encryption. The box in GREEN is what is available on the Oracle Cloud. Now I know not every consumer of Oracle EPM products have the entire suite like this, but there sure is a subset of some sort. The point being is that if you have already invested in an on-premise ERP,CRM, EBS, etc system why would you consider the cloud for just a small piece of the overall picture? Planning modules. (Capex, WFP, Project Planning, HPCM, etc) Only Core planning is supported currently. Flat file ETL instead of ODI direct. You have to FTP flat files to the cloud and the cloud instance actually uses ERPi to load. Funny – The biggest selling point of ERPi is drill back to source systems – how can you do that when your system is hosted elsewhere? 4. Is Internet latency going o be a problem when connecting clients? What about Smartiew connections? Financial Reporting Studio? 5. You will still have to administer. It’s not set-it-and-forget-it. And handle backup/recovery. Oh – and don’t forget it’s LINUX! 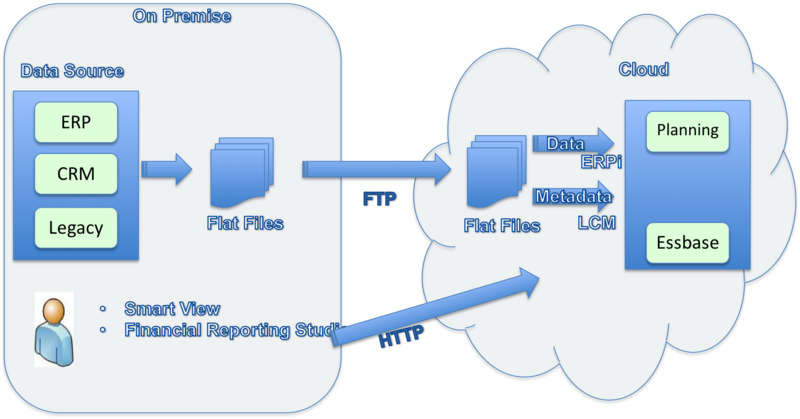 You will need to send source data to the Oracle Cloud via FTP in Flat files for ERPi to load into Planning/Essbase. I would be concerned if that data is really large and/or you have to do it quite frequently. Also – I hope that Oracle provides secure FTP connections as you are sending raw financial data over the public Internet. For metadata, it seems that the initial load will probably be done with the Outline Load utility and LCM will handle incremental Metatdata migration. How will the Oracle cloud authenticate with your internal corporate directory? I’m still trying to get information about this. If you have hundreds of users that authenticate via your internal corporate MSAD or LDAP how does that connection work? Either you will have to allow for the connection (and Internet latency) for the Oracle Cloud to directly connect to your internal corporate MSAD/LDAP to authenticate each user (not gonna happen) or they will have to furnish their own MSAD/LDAP servers that syncs with yours periodically via a push process (not real time). May be possible but are they going to charge you now for a directory server? What are the backup policies? Are they going back up the system or does the customer have to do that? If Oracle does it, how is it done? Does the system need to be down during a backup? Do I need an offline maintenance window so they can take their VM snapshots at a certain time? What about the database repositories, where do they live? They are not supported on the Exalytics platform. Considering your development environment on the cloud? The rumor is that a few organizations are considering the Oracle cloud for their non production (DEV/TEST) systems. My question is why would you not do all or nothing? The whole point of a development and test environment is to simulate a production environment so that we can fully test new functionally and know for sure that it works perfectly before allowing that into my pristine and mission critical production system. Also – lets not forget about apples-to-apples PERFORMANCE testing in the lower environments. Acceptable performance metrics are a necessary requirement to promote an artifact to production. The Oracle Cloud service has the potential to be attractive and fit the bill for certain situations. However there are a lot of unanswered questions and a lot of considerations when deciding between on-premise or cloud deployments. You are still going to have day-to-day IT and functional maintenance. Given the fact that source systems, external authentication security providers, and users are all on-premise there will be technical infrastructure requirements that must be implemented to facilitate on-premise to cloud communication. I’d take a deep look to fully understand if that will require the same IT knowhow/effort the cloud is trying to supplement. I will post more as I learn more. If you participate in the preview program or have anymore info, please feel free to reach out. ~ by Eric Helmer on October 18, 2012. Really Useful. Thanks. Hope to get the new updates on the same topic from you if there is any advancement from oracle on PBCS.